The Palace of Versailles is a royal palace with gardens built by King Louis XIV and located just outside of Paris, France. 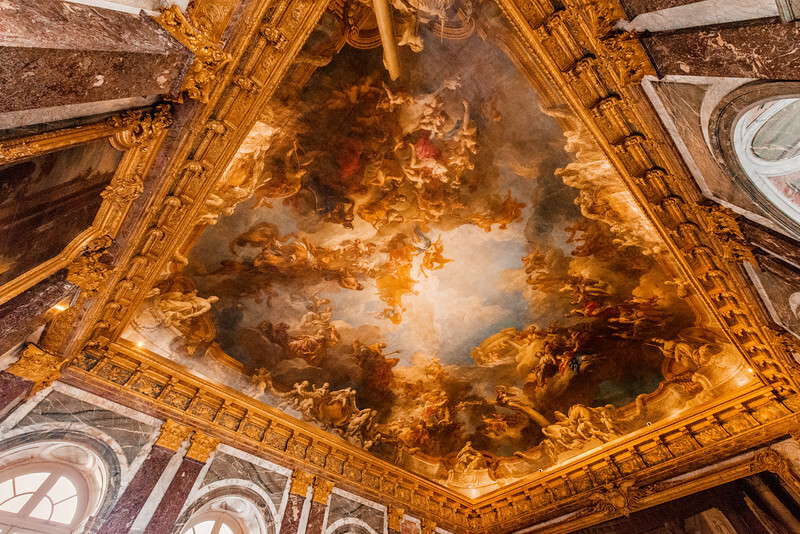 This post covers tips for visiting and making the most of your time at the Palace of Versailles (or the Château de Versailles, as it’s known in French), plus a ton of my photos from Versailles. 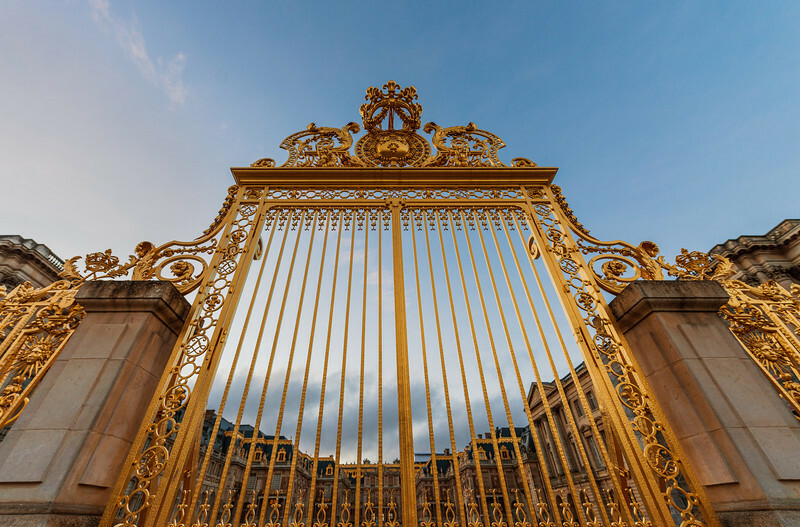 If you’re reading this and thinking about going to the Palace of Versailles, chances are you’re an English-speaking tourist staying in Paris. (The first thing you should know is that there are a few options for getting to Versailles via train. We took the “shortest” of the options and it still took us about an hour to get to Versailles from Paris. Guidebooks might show a couple of the routes taking significantly less time, but once you factor in walking from the train station, etc., you’re probably looking at at least an hour-long commute from central Paris. Based on this, I’d recommend leaving Paris about 2 hours before you want to step inside the Palace of Versailles. You’ll understand why further in the post. With that in mind, you need to determine when to visit. The dates of your trip are probably already set, but if they’re not, we highly recommend not going to Versailles in the winter. The Gardens of Versailles are a huge draw, and France has relatively harsh winters, so there’s not nearly as much to see in the winter months. We went in November, and while it was still quite pretty back there, it didn’t even remotely do justice to photos we had seen. Because of this, we’re planning to return to Versailles in the early-fall, after summer crowds have died down but before the gardens disappear for winter. As for the time of day to visit, hours vary depending on when you’re visiting–you can find current hours here. We had heard that the absolute best times to visit Versailles were right when it opened and just before it closed, as crowds could be pretty bad at other times. Our original plan was to visit first thing in the morning to get there for 9 am opening, but when our alarm went off at 7 am, we just couldn’t do it. Instead, we arrived about two hours before closing. This ended up working out fine, and when we arrived there were far more people leaving than there were arriving. There was no wait to get through security (our guidebook indicated that the security line would be over an hour during peak season at peak times of the day) and the galleries were fairly empty. The Palace of Versailles, itself, was still quite crowded, though. Next time, we’ll definitely get inside the Palace of Versailles at 9 am and beat the crowds. Although visiting later in the day was the right thing for us to do from the perspective of crowds, it meant we only had an hour and a half inside, and about an hour outside. While an hour was about fine for the tour of the Chateau of Versailles itself, it would have been nice to have spent some more time in the galleries, or to have done the add-on tours. Other times of the year, I would have wanted to spend more time in the gardens, too, but in November it was so cold that we were both ready to get out of there once the sun set! 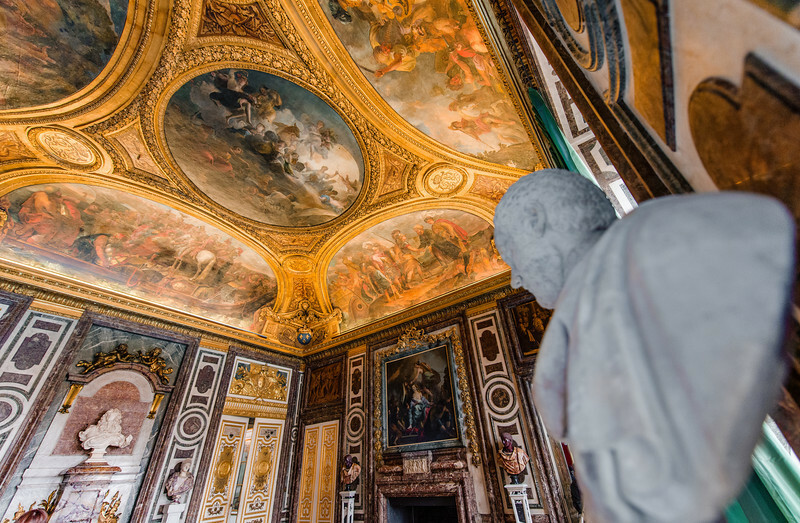 You could easily spend a half day or longer at Versailles (a full day once you include other sights in the city of Versailles), and given the commute, that’s probably a wise move. Next up is tickets. There are numerous ticket options at Versailles, and I can’t really offer a solid comparison among the options because we simply opted for the basic “Palace” level option. This is the basic option and what most guests will purchase. There are add-ons available for other locations–if you’re planning to spend all day at Versailles, you might consider the add-ons. The advice I can offer here is to buy your tickets in advance. We did not do this and we were fortunate that we didn’t have to wait long to get our tickets, but if the long, empty maze we had to walk through for the ticket line was any indication, it gets very long during the middle of the day. Make sure to grab the audio guides, which are included in the cost of the tickets. I often skip audio guides as I find them distracting and they take me out of the moment, but this audio guide was incredibly helpful. 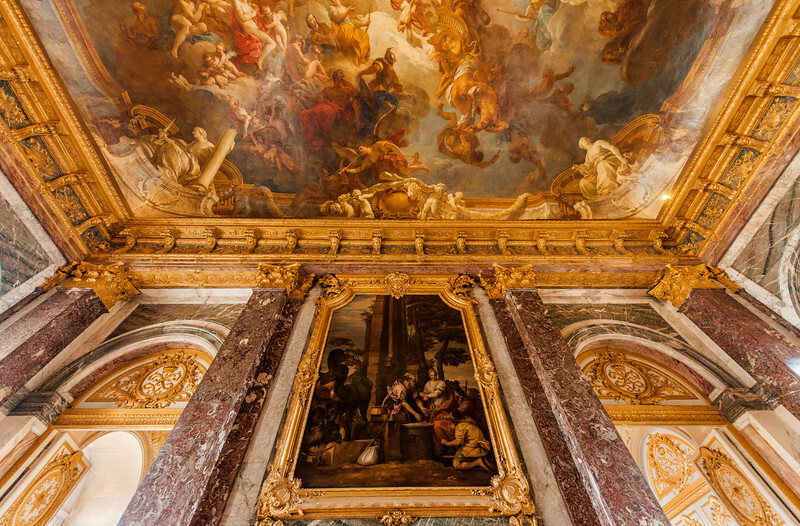 The Palace of Versailles is incredibly lavish, and I think without a guide to give each room some context, there’s a high likelihood of “fatigue.” It’s hard to explain, because each of the rooms is beyond superlatives on its own, but once you see four rooms with these crazy-ornate details, what does room five really bring to the table? (At least that’s how I felt–your mileage may vary.) The audio guide offers the rich history of each room in the palace (as you’re in the room), and otherwise keeps things interesting when it otherwise might seem redundant. I think this context is important, and it certainly made me care about each individual room we visited. To that end, if you really want context, your best bet is reading about Versailles before your trip. I recommend checking out this book, either from your local library or by purchasing it on Amazon. One of the main reasons I wanted to visit Versailles was because the photos I saw showed an incredibly photogenic setting, and I love photography. In actuality, most photos you see of the Palace of Versailles are publicity shots taken during non-operational hours. 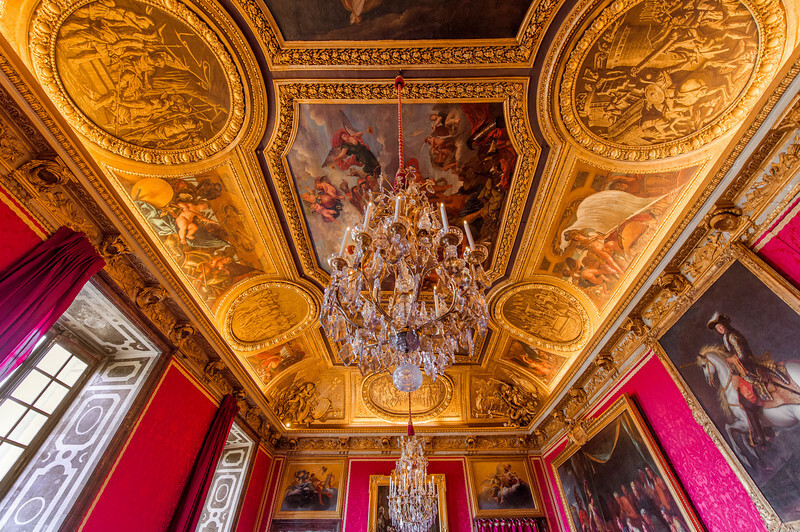 For normal guests, photography in the Palace of Versailles is going to be incredibly challenging. However, I found that bottlenecks formed at various places in the Palace of Versailles, typically thanks to those iPadographers that many photographers so detest. (Thanks, guys!) If you can get ahead of a bottleneck, you have a good chance at photos with few other visitors in them. We also found that there was a bottleneck about halfway through the Hall of Mirrors that I would assume is common bottleneck, as this was where a line formed for one of the add-on chamber tours. This bottleneck allowed me to get the above photo of the Hall of Mirrors. While the photo is empty, I can assure you that there were a ton of people about to break through the bottleneck behind me. If you find yourself benefiting from one of these bottlenecks, be prepared to act quickly–you’ll only have a few seconds to take photos before an empty scene like this transforms into a crowded one. Make sure to get all the photos you want of a particular room before leaving that room. 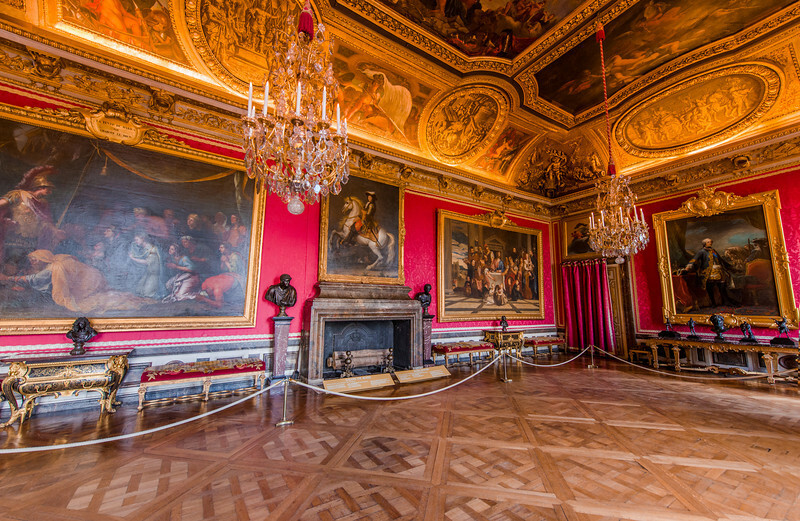 The “tour” of Versailles is linear, so you can’t really bounce around among multiple rooms in any particular order. It’s also important to know that it can be difficult, if not impossible, to backtrack. 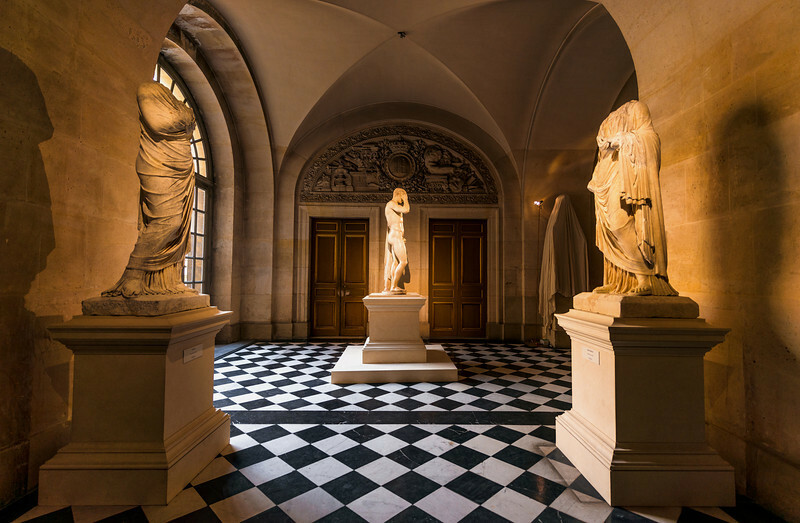 In addition to the Palace of Versailles, you’ll want to spend time in the galleries and the gardens. The art in the galleries is breathtaking, and we were both astounded by the number of years artists toiled on each individual piece (we also felt bad for them, as they sounded a bit like glorified slaves). In any case, you could spend a lot of time just looking at the art in these galleries. As for the Gardens of Versailles, even in the winter they were beautiful, but we didn’t see enough of these to offer solid tips here. We can say that you will want to spend a lot of time out in the gardens. 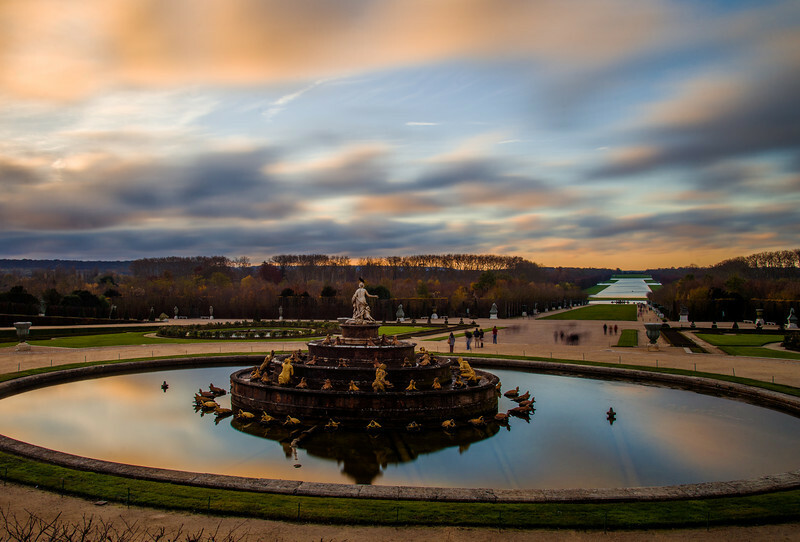 We hope to have a post for the Gardens of Versailles (and its beautiful fountains) once we return to Versailles! 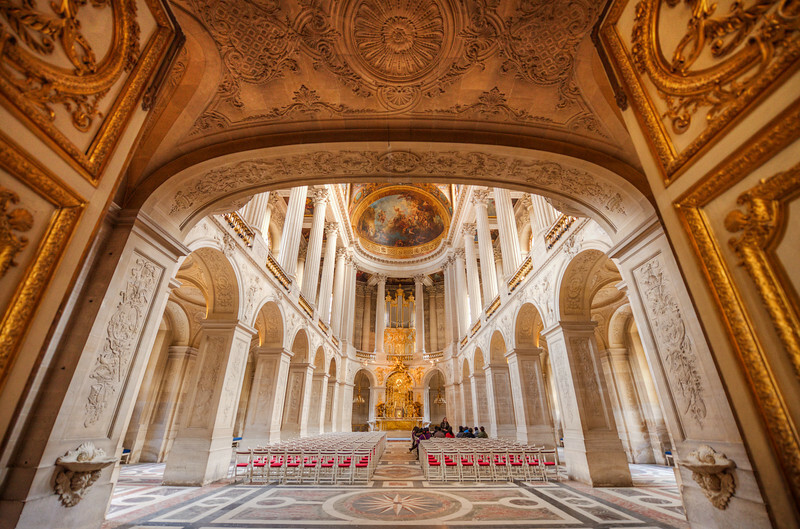 These Palace of Versailles photos were shot with a Nikon D600. Interiors were all with the Nikon 14-24mm f/2.8 Lens, handheld. Outside shots used that lens, plus the Rokinon 8mm Fisheye and the Nikon 24-105mm f/4 lens (with the Hoya ND400 neutral density filter and a tripod). 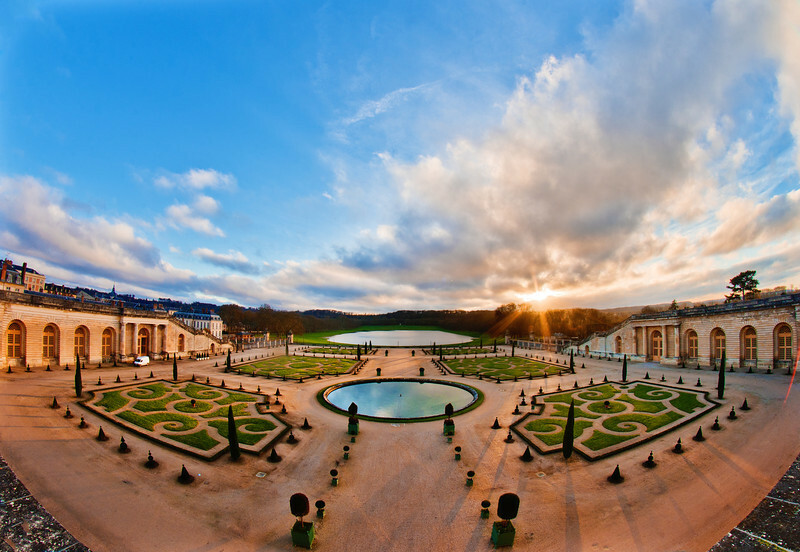 To get some more Versailles photo ideas, check out my Versailles, France photo gallery. 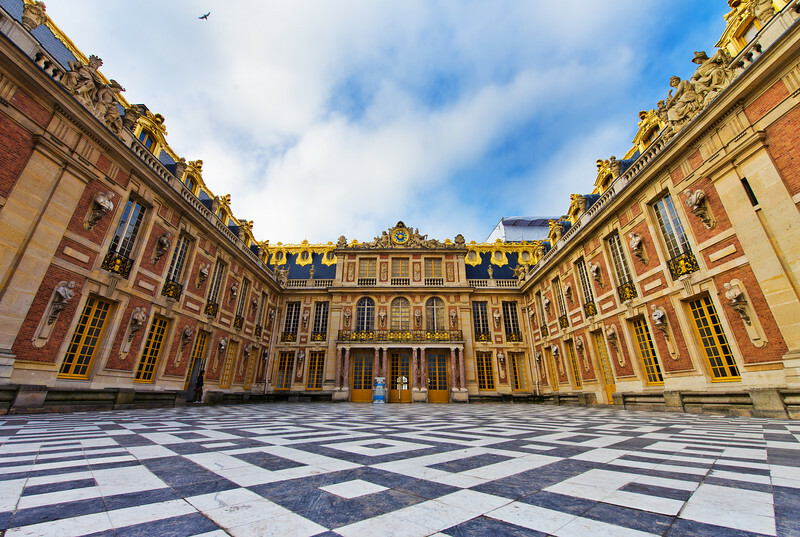 What do you think of the Palace of Versailles? Have you ever been? Do you think it’s gorgeous, or a bit over the top? Do you have a favorite room? Please share your thoughts in the comments! Incredible photos! Just wanted to comment and say, though, that by no means is Versailles a half-day event. If you want to see all it has to offer, you will need a full day or more. It is so much more than just the palace and main gardens. I don’t don’t that they were exaggerating. It seemed like a VERY popular destination. Do you have a link to your photos of the gardens that you could share? I’d love to see it with the fountains on! I’m very flattered that you (the famous Tom Bricker! ;)) would ask to see my photos, but unfortunately I went to Versailles a few years ago, before I got my dslr. I am planning to go again next month, however, and though I’m nowhere near as amazing of a photographer as you, at least now I have a DSLR and an ND filter! 🙂 Maybe I’ll share some photos then. Haha even now I’d be kind of ashamed to link to my pictures though! 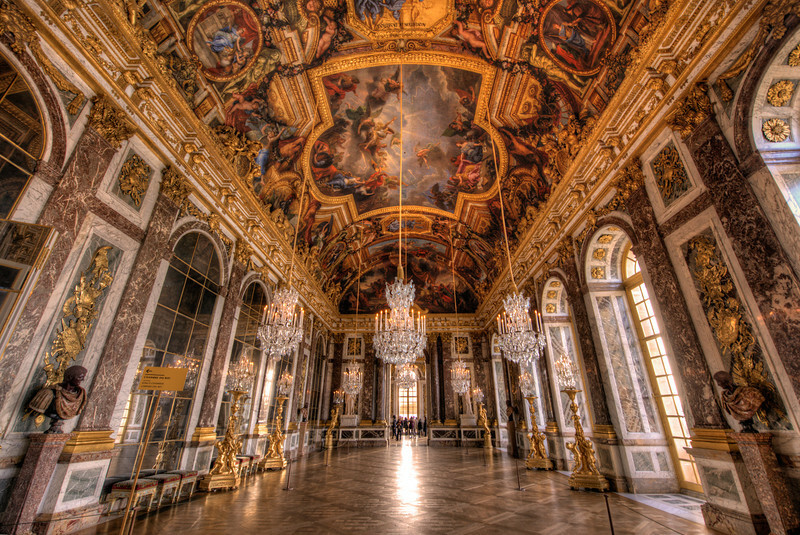 First of all, I love your photo of the Hall of Mirrors! When I went there back in August of ’96, I could really only get a shot of the hordes of people that were in front of me! I absolutely loved the queen’s bed chamber when I was there. It was just so beautiful! And I could have spent hours in the gardens there! Being there truly was like stepping back in time!